Have you ever been wondering how you could enjoy those French fries or those crispy fried chicken wings without the excess calories and fat? If yes, then this GoWISE Air fryer review is certainly for you. With the GoWISE Air fryer 3.7qt, you can finally bid farewell to excess because in here, air is the new oil! How does it work? Check out in the GoWISE Air fryer review below. The GoWISE Air fryer comes in four colors, white, chili red, plum and black so you’ve got a lot of options in color. 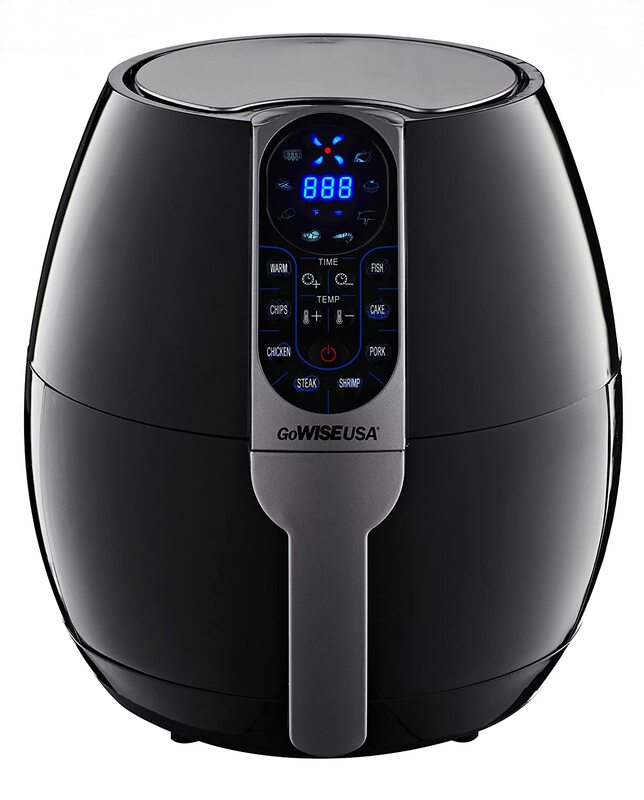 The black model, with the model number GW22638, is the subject of this GoWISE Air fryer review. The first thing that will get your attention is how beautiful and slick this air fryer had been designed. The GW22638 model has a capacity of 3.7qt, same as with the others, and weighs about 13lbs. It has a dimension of 8 x 12 x 8 inches and comes with a detachable dishwasher-safe basket. The GoWISE Air fryer 3.7 uses Rapid Air Technology to air fry foods by surrounding the food evenly with super-heated air at a very high speed. It is, therefore, able to cook your favorite fried dishes without the usual use of oil as seen in deep frying, a feat that boasts a great benefit to our wellbeing. Many air fryers are capable of frying with air, without the use of oil, but why do you need the GoWISE Air fryer 3.7 specifically? Read on. This GoWISE Air fryer review is intended to explore the various areas in which the GoWISE Air fryer 3.7 shines. Apart from frying your food to awesome deliciousness without oil, the GoWISE USA Air fryer is capable of performing various other cooking processes with 8 preset options. These options include warm-up, steak, fries and chips, chicken, fish, shrimp, cake, and pork. It features a specially constructed digital interface for controls and settings to ensure that foods are cooked to your desired taste. People fall in love with the GoWISE USA Air fryer due to these and many more features and this has accounted for why the air fryer is one of the best sellers among so many air fryers in the market. Capacity & Size: The GoWISE USA Air fryer has a capacity of 3.7qt, enough to serve a family of three. It also weighs 13lbs and measures about 8 x 12 x 8 inches in dimensions. Temperature Control: The GW22638 GoWISE Air fryer gives you the flexibility to adjust and control temperatures according to the need for various food types. The temperature range is between 170F to 400F. This guarantees your flexibility to cook to the desired taste, a feature that is rare among some other competitors. Versatility: There is the ability to cook various other types of food apart from air frying. You could steam, bake, grill and cook a host of other different meal types with the help of the 8 preset options in the GoWISE Air fryer. Safety: The air fryer has a lot of safety-oriented features. For instance, the timer shuts off automatically after cooking is complete to avoid overcooking or burning. The timer also shuts off after every 30 minutes of activity. The air fryer also has two light indicators for notifications and the handle is cool to touch and never gets hot throughout the cooking session. It is also ETL-Certified. 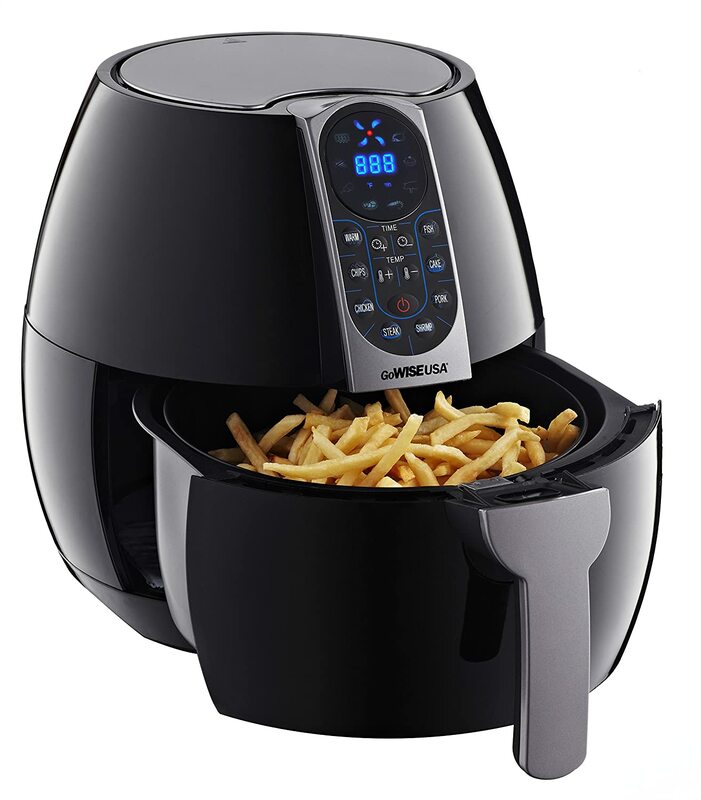 Power: The GoWISE USA Air fryer is rated at 1400watts. Oil-free Cooking: It is able to cook absolutely with no oil, using rapidly circulating hot air. The GoWISE Air fryer 3.7 comes with a recipe book and a removable drawer. However, for optimal use, you can check on Amazon for various other accessories available for the air fryer. The air fryer is very simple to use. You basically have to remove the detachable drawer and load your food. You then set the timer and temperature and wait a few minutes for your favorite oil-free meal to be ready. It is easy to use due to the digital interface. The removable parts are dishwasher safe and can be cleaned easily. It is safe to use due to the automatic timer. The temperature control gives it flexibility. It has a volume of 3.7qt, mid-range, not too small and not too large. The air fryer can be used for other types of food apart from frying. It has 8 preset options for quick use. The air fryer cooks faster than many other air fryers. This GoWISE Air fryer review would be totally incomplete without touching the downsides of this air fryer. We tried our best to find out the flaws in this air fryer, it is almost flawless. Of our findings, the only thing that seems to be an issue is pricing. It is a bit expensive, but this is normal when you also consider the functionality of the GoWISE Air fryer. The GoWISE Air fryer is highly recommended to take your cooking experience to the next level. If you don’t mind shelling out a few bucks, the GoWISE Air fryer may just be your perfect answer to air frying. Remember the common phrase that premium comes at a price? It’s true of the GoWISE Air fryer 3.7. Air fryers offer the best alternative to excessive oil use in deep frying, they fry and cook delicious and crispy meals with little or no oil. 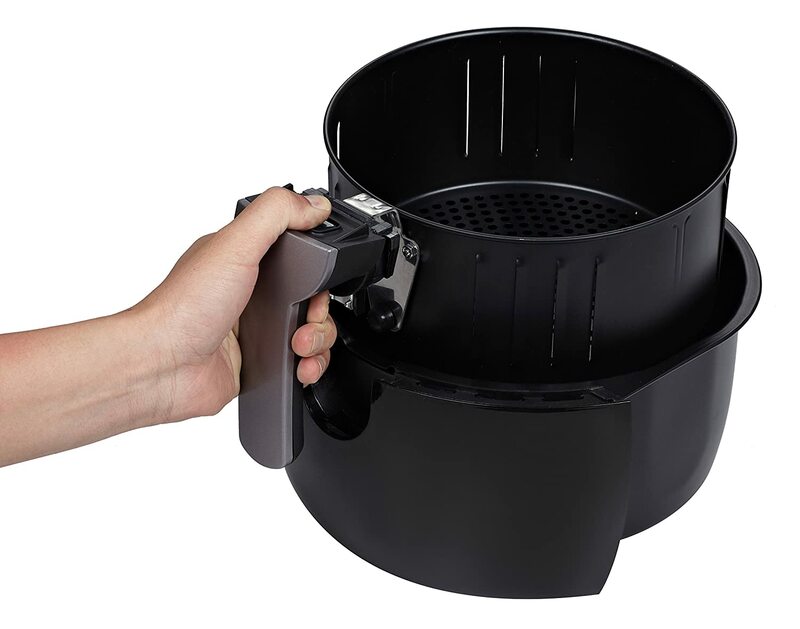 While many air fryers will basically do this, the GoWISE USA Air fryer goes a bit further to improve your cooking experience with user-oriented features. Even though it’s a bit expensive, it is an investment that is going to make a significant impact in your lifestyle in the long run. You know they say ‘premium comes at a price’, they were actually referring to this air fryer. I’m hoping this GoWISE Air fryer review will help you in making the right decision, take charge of your health today and invest in this wonderful kitchenware.